Thailand’s most spectacular riverside landmark, ICONSIAM, today, opened with a dazzling programme that included the largest flying drone display ever organised in Southeast Asia with more than 1,500 drones, and attended by tens of thousands of well-wishers, celebrities and Thailand’s ‘Who’s Who’. The US$1.65 billion landmark is one of Asia’s most exciting new developments and is billed as a 750,000 square metre mega-destination that “brings together, in a single destination, a great riverside location with art, culture, lifestyle pursuits, endless dining options, super-luxury residences, and shopping. It’s a place to regenerate and refresh, to be inspired and seek new ideas, and a place to discover the best of Thailandand the best on offer from around the world,” according to Mrs. Chadatip Chutrakul, Director, ICONSIAM Co., Ltd. Among the outstanding features at ICONSIAM is the River Park – a 10,000 square metres riverside community space that is open to the public every day. There is also multimedia water feature, which is the longest in Southeast Asia, that is designed to be a global iconic attraction, “and do for Bangkok what the London Eye does for London and the Botanic Garden at the Marina Bay Sands does for Singapore,” Mrs. Chutrakul said. There is also Thailand’s most technologically advanced auditorium that aims to boost Thailand’s international incentives and convention industry. 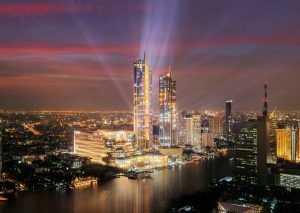 It is scheduled to open in July 2019, at the same time as ICONSIAM’s ‘River Museum Bangkok’ which will be the first world-class museum in Thailandand capable of hosting top world-touring exhibitions. Among the ‘first-ever’ brands and stores is Takashimaya, Japan’s legendary department store; the first flagship Apple Store in Thailand; Japan’s most successful cosmetics specialty store @Cosme; H&M with first-ever triplex store; Urban Revivo; the first outlet in Thailand for multi-brand sports fashion chain JD Sports; the first Nike Kicks Lounge in Southeast Asia; Asia’s largest Adidas Original Store; and an area of 2,500 square metres called ICONCRAFT that presents Thailand’s creativity at its best by assembling a vast array of art pieces and contemporary craftwork by Thais.